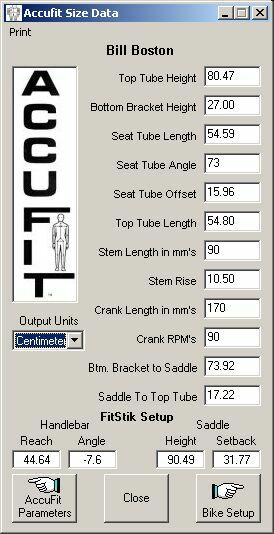 The Accufit Size Data is provided on the form shown below. The default units are millimeters. You can select either centimeters or inches as desired under Output Units to have the values recalculated. Notice that the form below is displayed in centimeters with the exception of Stem Length and Crank Length that are always given in millimeters. If you have a FitStik, you can use the FitStik values provided to setup your existing bike. If you are going out shopping for a bike, print this form and take a tape measure with you. Look for bikes that have top tube heights, bottom bracket heights and top tube lengths closest to those provided, Also, find out the seat tube angles for the bikes that you look at. Bring the data home and use Personal Accufit and the Bike Setup form to help decide which bike to buy and how they should be setup to match this data. You can see how your body will look relative to this design by pressing the Draw Rider button on the upper left corner of the main form.